And likewise also the Spirit helps our weaknesses, for we know not what we would pray for as we ought, but the Spirit itself intercedes for us with inexpressible groanings. And in the same way, the Holy Spirit helps [us in] our weakness; for we do not know what we ought to pray for [Note: Some translators understand this as "how to pray"]. But the Holy Spirit goes to God on our behalf with groanings [in our hearts] that are not expressed [in words]. In like manner, also, the Spirit helps our infirmities; for we know not what we should pray for as we ought, but the Spirit itself intercedes for us, with groanings unutterable. 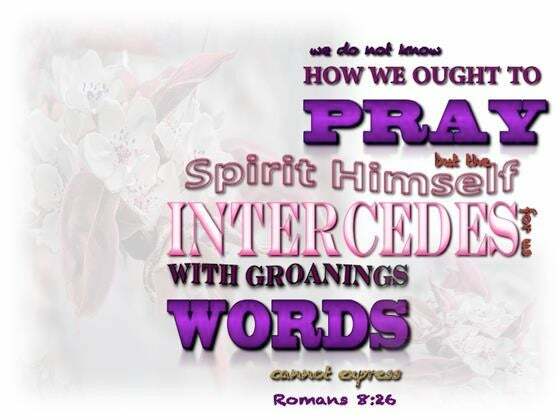 Likewise the Spirit helps us in our weakness; for we do not know what to pray for as we ought, but the Spirit himself intercedes for us with groans that words cannot express. The spirit likewise softens our afflictions: for being at a loss to apply for the most proper relief; the spirit it self affects us with those pious ejaculations, which we can't well express. Likewise the Spirit also helpeth our infirmities: for we know not what we should pray for as we ought; but the Spirit itself maketh intercession for us, with groanings which cannot be uttered. 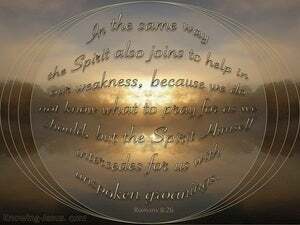 And likewise also the Spirit takes hold together, and assists our weaknesses: for what we would pray for as we ought, we know not, but the Spirit itself intercedes for us with inexpressible groanings. And likewise also, the Spirit helps [us] in our weakness, for we do not know how to pray as one ought, but the Spirit himself intercedes [for us] [with] unexpressed groanings. Likewise the Spirit also helps our infirmities. For we do not know what we should pray for as we ought, but the Spirit Himself makes intercession for us with groanings which cannot be uttered. Likewise, the spirit also helpeth our infirmities. For we know not, what to desire as we ought: but the spirit maketh intercession mightily for us with groanings which cannot be expressed with tongue. In the same way, the Spirit also helps our weaknesses, for we do not know how to pray as we ought. 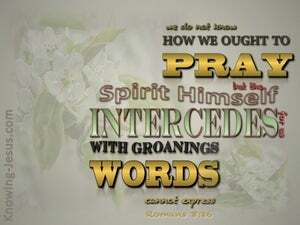 But the Spirit himself makes intercession for us with groanings which cannot be uttered. In like manner the Spirit also helpeth our weakness; for we know not what to pray for as we ought, but the Spirit itself intercedeth with groans which cannot be expressed in words. In like manner also the Spirit affords assistance to our infirmities: for even this, what we should pray for as we ought, we know not: but the same Spirit more abundantly maketh intercession for us with groanings unutterable. So, also, the Spirit supports us in our weakness. We do not even know how to pray as we should; but the Spirit himself pleads for us in sighs that can find no utterance. And, in like manner, the Spirit also helpeth our weakness; for we know not what to pray for as we ought; but the Spirit Himself maketh intercession for us with groanings which cannot be uttered. And the Spirit likewise helpeth our infirmities: for we know not what we should pray for, as we ought: but the Spirit itself intercedes for us with unutterable groans. 25 But if we hope for what we do not see, with perseverance we wait eagerly for it. 26 In the same way the Spirit also helps our weakness; for we do not know how to pray as we should, but the Spirit Himself intercedes for us with groanings too deep for words; 27 and He who searches the hearts knows what the mind of the Spirit is, because He intercedes for the saints according to the will of God. And my soul is greatly dismayed; But You, O LORD--how long?